QinetiQ is to develop an electric hub-drive to improve survivability and mobility of future military ground vehicles for the US Defense Advanced Research Projects Agency (DARPA). The contract, worth $1.5m with an option for a further $2.7m, is part of DARPA’s Ground X-Vehicle Technologies (GXV-T) programme. Under this programme, participants will investigate technologies that could help to significantly improve capability in the next generation of vehicles. 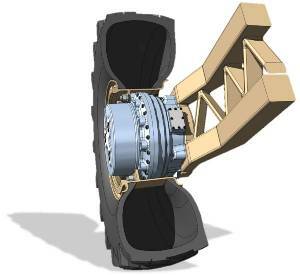 QinetiQ’s hub-drive seeks to improve mobility through enhanced power, torque, integral braking and high efficiency, in a unit that can be contained within a 20” wheel rim. It aims to increase survivability by removing drive shafts and gearboxes, which can become lethal to occupants in the event of an IED detonation beneath the vehicle. The absence of these components could also reduce weight and open up future design possibilities, such as fully independent suspension with significantly increased travel. Dr David Moore, Director of Research Services at QinetiQ, said: “Like cavalry horses throughout history, vehicles risk becoming less mobile as they are loaded with more armour and weaponry to meet the evolving demands of warfare. Our hub-drive tackles that threat by combining optimum performance with a significant weight saving, which is critical for mobility. It also introduces a far greater degree of architectural flexibility, enabling vehicles to be configured in ways which offer greater protection to their occupants.